Claus Madsen has devoted his professional life to two strands of activities: International science policy and public science communication. He joined the Science Division of ESO, the European astronomy organisation, in 1980 and became a member of the Office of the Director General in 1988. He has served in various functions at ESO, including a five-year term as ESO representative towards the European Union, and, following later project-related stints at the European Fusion Development Agreement’s JET facility in the UK and CERN in Geneva, has now returned to ESO. He has published books and articles on a variety of topics including astronomy, science communication and science policy. 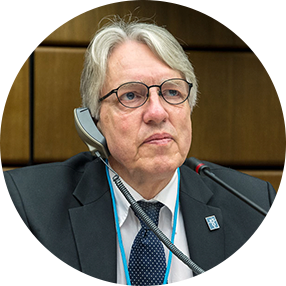 He has served as an expert advisor to several international organisations, the European Commission and national governments, and participated in working groups among others of the United Nations and the International Astronomical Union. He has served two terms as Chairman of the Coordination Group of the EIROforum, the partnership of the large European intergovernmental research organisations. Claus Madsen is a member of the International Astronomical Union, the International PCST network, the AlphaGalileo Foundation, honorary member of the European Association for Astronomy Education and honorary member of the Austrian Society for Astronomy and Astrophysics. In 2010, Minor Planet 1999 TN19 was named (91604) clausmadsen by the IAU Minor Planet Center at the Smithsonian Astrophysical Observatory, Cambridge.